Turkish Turkey Meatball Lettuce Wraps with Tzatziki are healthful, light, easy, fun and so flavorful! It’s the perfect summer dinner full of fresh ingredients! Ha. You get me, Honey! I’ve never been to Turkey but do have a little knowledge of Turkish cuisine. Proteins most often found in Turkish cuisine include seafood, lamb, beef and chicken. When I searched my Turkish cookbooks for turkey as an ingredient in a recipe, I wasn’t able to find any. Whereas meatballs such as these would be made with lamb in Turkey, not everyone in this country is big on lamb. Ground lamb can also be quite fatty. In addition, ground lamb is often twice the price. This recipe is similar to my Turkish Ground Lamb Kebabs but the meatballs are baked rather than grilled. 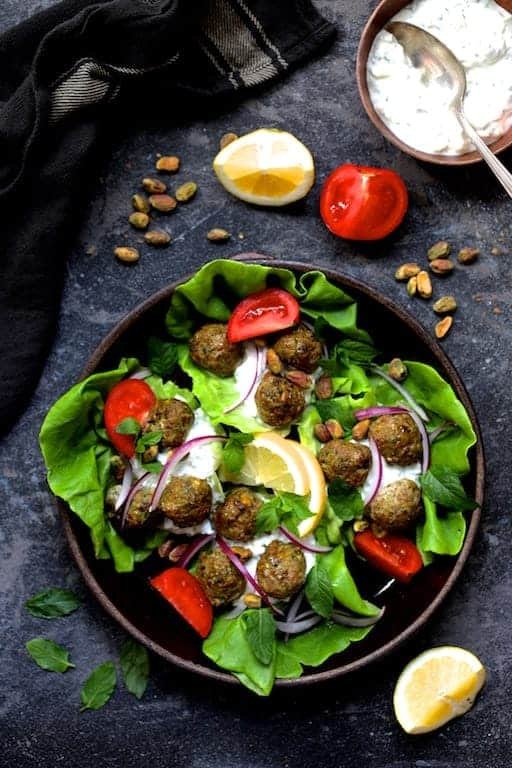 This Turkish Turkey Meatball Lettuce Wraps recipe is so easy but tastes so exotic! Basically, all you do is combine the meatball ingredients in a food processor or blender, process away, add an egg, the turkey, form into meatballs bake and you’ve got a healthy meatball wrap meal! The most exotic part of this recipe is the “baharat.” Don’t worry. It’s only a combination of herbs and spices you probably already have in your kitchen, much like Cajun seasoning. When I make meatballs, I combine all the ingredients except for the meat. I feel the other ingredients will be better distributed in the meat if they’re combined first. I then add the meat, put on disposable gloves and mix everything together with my hands. The best way I have found to portion and form meatballs is with a cookie dough scoop. I have several sizes and for these, I use my 1-inch scoop. Grab a handful of the meat mixture in one hand and the scoop in the other. Use the heel of the hand holding the meat mixture to level off the scoop. Empty the scoop on a baking sheet. After portioning the meat mixture, press the cheese into the center and roll into neat balls. Mix up the tzatziki while the meatballs bake. This makes a wonderful exotic summer dinner! 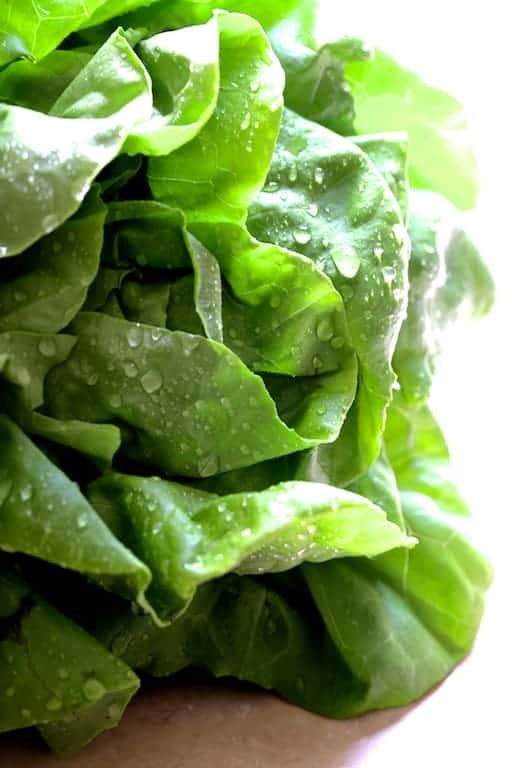 Be sure to check out my other delicious lettuce wrap recipes! 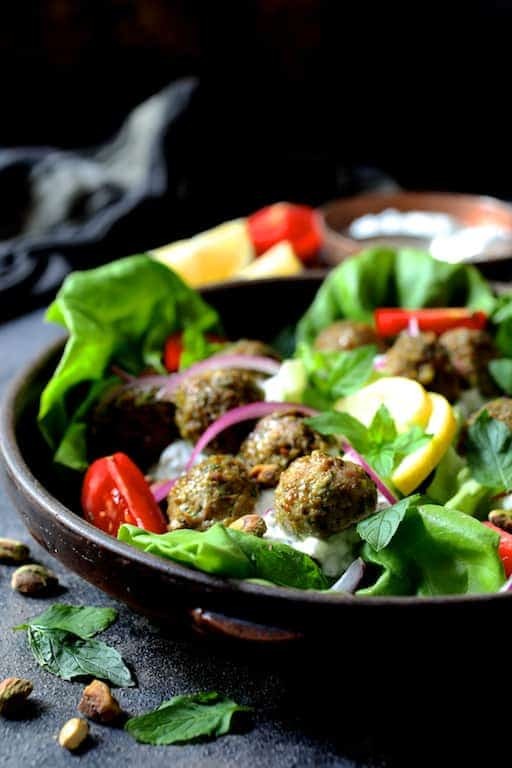 Turkish Turkey Meatball Lettuce Wraps with Tzatziki are healthful, light, easy, fun and so flavorful! It's the perfect summer dinner full of fresh ingredients! MEATBALLS: Preheat oven to 350 degrees. Spray a nonstick baking sheet with cooking spray. Alternately, line a baking sheet with nonstick aluminum foil and spray. 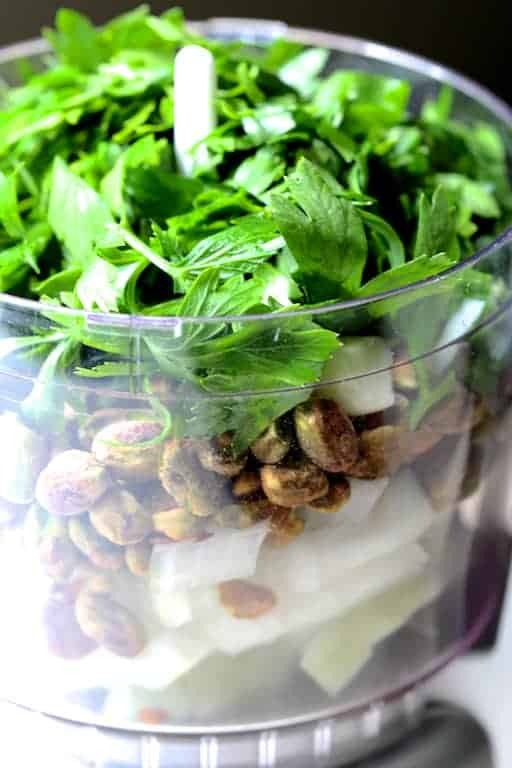 Combine the next 8 ingredients in a food processor. Process until smooth. Transfer to a bowl and mix in egg. Add the turkey and mix well. Form into 1-inch meatballs and place on prepared baking sheet. Bake for 15 minutes or to an internal temperature of 165 degrees. 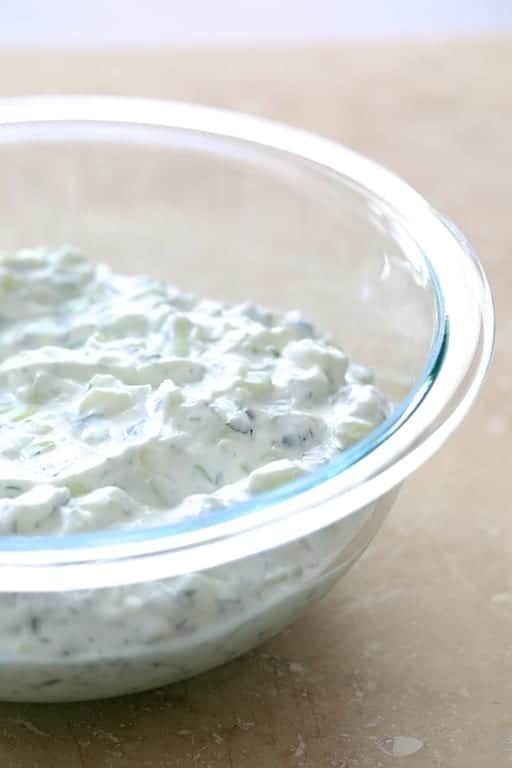 TZATZIKI: Combine tzatziki ingredients in a bowl. 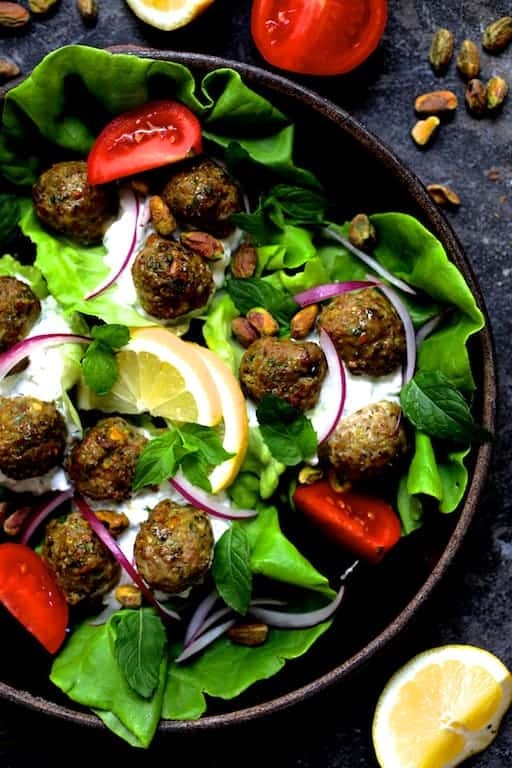 TO SERVE: Top lettuce leaves with tzatziki, top with 2 or 3 meatballs, onion slices, a tomato wedge, pistachios and mint leaves. Roll up and enjoy! BAHARAT RECIPE: 1 1/2 tablespoons dried mint, 1 tablespoon dried oregano, 1 tablespoon freshly ground black pepper, 1/2 teaspoons each of ground cinnamon, ground coriander, ground cumin and ground nutmeg. Carol, these look absolutely delicious! I made my first homemade tzatziki last week and I was surprised by how easy it was. Mine was a tad different (grated cucumber and dill, no mint), but yours looks fabulous. I have pinned this to my “must-try” board for the upcoming week! Thanks, Chava! Hope you enjoy! I had purchased Ground Turkey with the intent of making meatballs to eat in some awesome Pita Bread when I read this recipe. I had the Baharat spice blend that I had purchased at a local Kosher grocer when I was recipe testing for an Israeli cookbook. I made the meatballs exactly as written, I added feta into my Tzatziki and we loved the Pita with Turkish Meatballs and Tzatziki! Next time will go with the lettuce wraps. Delicious meal either way! As always, good job Chef Carol! Thank you, Chef Jim! Yes, they’re very versatile and glad you enjoyed! Ive see often Bahrat called for in recipes and didn’t realize it was made of things I already had! I love when I learn new things that are so simply made! Beautiful photography too! What a fun presentation! I am *obsessed* with Middle Eastern food, and I’m toooootally swooning over that tzatziki! Thanks, Ashley! I know…. Middle Eastern food is so flavorful and healthy!